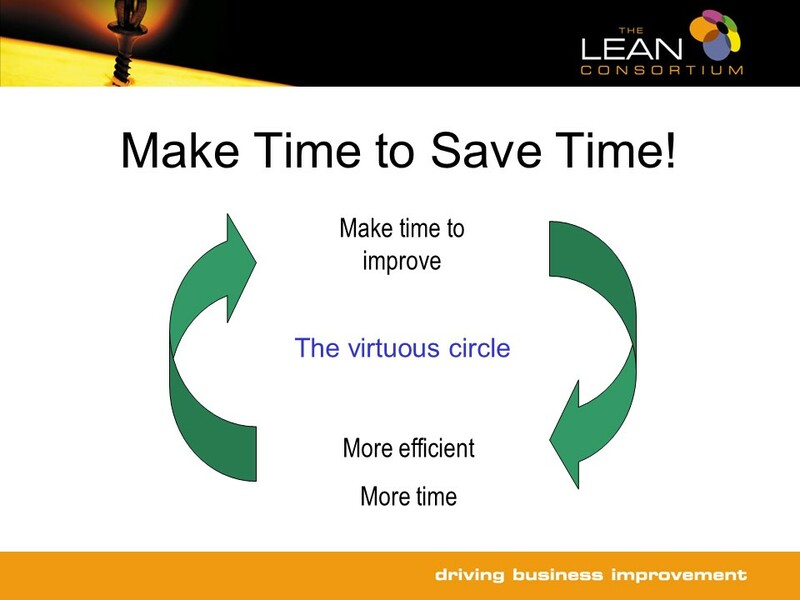 Once you’re up and running with Lean and Continuous Improvement, you’re in the “virtuous circle” where you’re continuously becoming more efficient, saving more time, and investing some of that time in becoming even more efficient. But if you’re very busy and you haven’t yet started your Lean journey, what do you do? The biggest danger to avoid is just to “wait until things quieten down”. This approach can be self-fulfilling – but not in a good way! If you don’t improve then the downside of “being busy” can be longer lead times, higher costs and reduced performance. All of which can lead to a permanent – sometimes fatal – reduction in business as customers go elsewhere. This is often called the “busy fool” approach – putting in more and more effort, but getting back less and less benefit. Instead, you need to get started on the virtuous circle by finding ways to “force in” about 10% of additional time and resource “up front”. To do this, you need to do a bit more of the things you always do to increase your capacity: work some short-time overtime, cut back on time-consuming unprofitable work, bring in additional labour, contract out some of the workload, reschedule low-priority work, etc, etc. And then you use some of that time to provide some short, sharp awareness training about Lean, non-value-added activities and the Eight Wastes. People will soon identify where the problems are, and come up with improvement ideas. Then you help the teams to prioritise their ideas and implement them. Focus first on improvements that save time and make the job easier. In no time, you’ll start getting some “quick wins”. Productivity increases, morale improves and people start to smile again. Pretty soon, you’ll experience the unusual sensation of having time to actually stand back and think. And then you realise that the virtuous circle has begun…. If you want help to break out of your own “Too Busy Improve” trap, contact Andrew.Nicholson@ImproveMyFactory.com. Pretty soon, you’ll be getting better results with less effort. And who knows, you might even start to enjoy work and live longer!